John Charles and Bill Buffie have provided something in The Christian Pluralist that has been needed for a long time--a voice from the pews. They are not theology professors; they are not clergy. They are part of what makes up the huge majority of every church--the laity. And their voice, and the many for whom I think they speak, is a necessary one in our time--a voice that speaks to questions of the importance of religion without that importance degenerating into absolute claims of absolute truth. Theirs is a voice that embraces religion but not religious intolerance; embraces Christianity as a spiritual path but not as a highway of hate; embraces the Bible as story but not as a weapon. Theirs is a voice that raises questions, seeks a community in which to explore answers, and one that calls for a truly common good. Theirs is a voice of the people, one that speaks in witness to the existence of something other than a religious right in our congregations. Theirs is an enlightened American voice, and it is one to which we should listen. Thomas J. Davis Chair Religious Studies Indiana University Purdue University at Indianapolis What gives this book its unique angle is that two serious-minded laymen--folks from the pews--wrote it rather than leaving the matter to theologically trained scholars. Buffie and Charles treat an important subject with sophistication, and the perspective they provide is valuable, accessible, and timely. Dr. David Bodenhamer Executive Director The Polis Center, Indianapolis IN Buffie and Charles have had the courage to share their misgivings about the direction taken by many Christians in denying authenticity to the religious searches and beliefs of others. Theyhave set out a discussion to assist these fellow Christians to open to and embrace others who believe differently than they do. They invite all to join in the work of creating a global community of religions and religious persons dedicated to the peace and common good of humankind. Judith C. Wimmer Professor, Religious Studies Edgewood College, WI As one who taught history, I vividly recall lively discussions with young people about how, during particular times, religious belief and resulting fanaticism triggered the most atrocious acts and fired the very hatred that truly religious people supposedly abhor. Sadly, we live in such a time today. Buffie and Charles provide a timely, thoughtful and balanced perspective about how religious faith, particularly from a Christian perspective, may embrace a diversity of belief. The book gently challenges those convinced of the infallibility of their own beliefs, supporting the often-ignored words of the Rabbi Jesus, "In my Father''s house are many rooms." The term "important reading" is bandied about ad nauseam, but if ever that description were appropriate, it is appropriate for this book. Dr. H. Douglas Williams Superintendent, Metropolitan School District of Perry Township Indianapolis IN The Christian Pluralist challenges us not to rethink our faith but to question our approach toward other faiths. The authors, William Buffie and John Charles, maintain that the core of Christianity lies in tolerance and understanding, and that true Christians - indeed, people of all persuasions who are true to their faith - should therefore adopt a tolerant and understanding approach toward other religions. Buffie and Charles express their argument eloquentlyand persuasively. Theirs is a voice of reason, acceptance, and compassion in a world that is, increasingly, influenced by religious absolutism, intolerance, and extremism. Clayton Bond, Business Executive Christian: One who lives according to the teachings of Jesus. 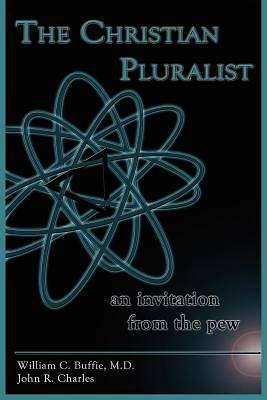 Pluralism: The belief that no single explanatory system or view of reality can account for all the phenomena of life.